One of my most used flannels this week, a super simple set for "5 Little Monkeys Swinging in the Tree." "When along comes Mr. Alligator, quiet as can be..." (hushed, palms together 'swimming' back and forth like a 'gator'). Then I pull one monkey off and make a spitting out noise, "Blech! that monkey tastes like________"
Repeat until monkeys are gone. 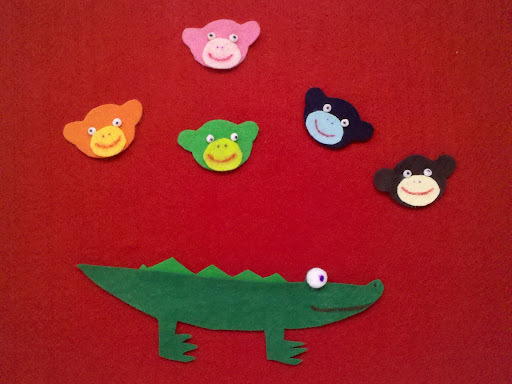 "No little monkeys swinging in the tree, old Mr. Alligator is hungry as can be!" 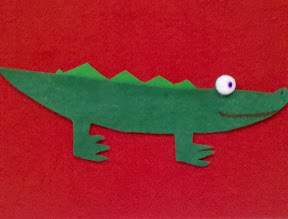 I totally love Mr. Alligator! So these are very simple basic cutouts, but what makes them lively is the 3D eyes. The eyes are pom-poms, and the mouths and pupils are drawn on with sharpies. 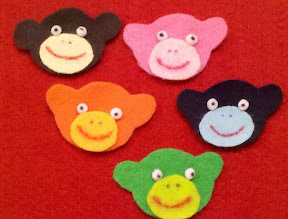 The monkeys snouts are a little larger than a nickel, if you're curious about scale. Pretty easy, and it makes the song a little more appealing. Such colorful little monkeys... and your googly-eyed alligator looks so happy! i bet the kids go bananas for it every time! The eyes kind of remind me of The Simpsons. In a good way. I totally see the Simpsons similarities. Love their little monkey mouths, too!